Making your very own traditional coleslaw couldn’t be simpler and for the cost of a small pot in the shops, you can make 10 times more! Dawn: This is a great side dish for any time of the year and especially at summer time when thoughts turn to delightful outdoors eating and leisurely summer days enjoyed beneath clear blue skies lying on picnic blankets, enjoying some of your favourite foods. Mix all the ingredients in a large mixing bowl, adding the salt and pepper to personal taste. Dawn: And hey presto! It’s made! It really is that simple! You may wish to add a squeeze of lemon juice to the ingredients to add a zing to the flavours: personally, I simply adore this without any lemon juice. It makes a filling, lovely snack for mid afternoon as well as a fab accompaniment to main dishes and can keep in an airtight container in the fridge for up to two weeks – if someone doesn’t eat it before!!! Not only is this delicious tasting and simple to make but the added beauty of this recipe is that the ingredients cost less than £1 to make a big bowl! And, what’s more, you know exactly what has gone into making it, too. A real winning combination! For more easy to follow recipes that won’t break the bank, follow this blog at www.forfoodlovers.wordpress.com. For regular food chat, simply follow @Love_Food_UK over on Twitter by clicking this red @Love_Food_UK link as well as finding this cooking sensation over on Mumsnet Bloggers Network, Foodies100 and over on Facebook at www.facebook.com/lovefood.forfoodlovers. Happy low cost, easy-to-make cooking, fellow foodies! Splendid Salads equal Super Salads! To be eaten with or without accompanying dishes, salads make a perfect nutritional collection of ingredients for all-year-round consumption. Dawn: Summer is almost here! And with the sunny, warm and long days ahead, our attention is drawn to thoughts of picnics, walks, playing outdoors and barbeques. Andrew: And what better a way to celebrate this season than pulling together some easy to follow and delicious dishes to enjoy underneath Mother Nature’s canopy?!? Dawn: My sentiments, exactly! Before we trundle headlong into the glorious season that Summer is, I want to add that salads aren’t just for Summer and can be an excellent and filling meal or accompaniment to a main meal throughout the year. Andrew: Exactly! So, what are we preparing today to tantalise the taste buds, Dawn? 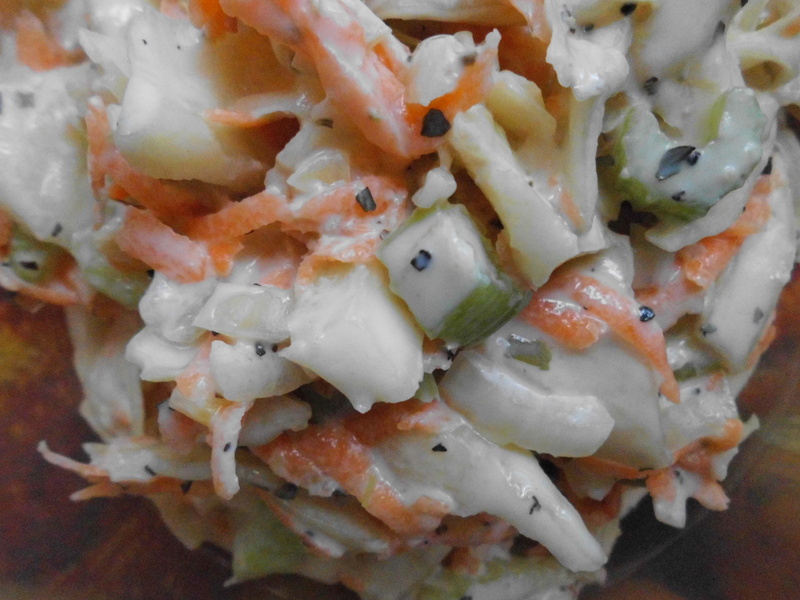 Dawn: A very easy, filling and healthy version of coleslaw that I dreamt up. So, without further-ado, I’m crack on. Put the white cabbage into a large mixing bowl. Gradually add the natural yoghurt and mix these two ingredients well together until you have achieved a consistency and texture you like. Dawn: No. I’ve just used a natural yoghurt which gives a very healthy ‘take’ on the traditionally used mayonnaise. 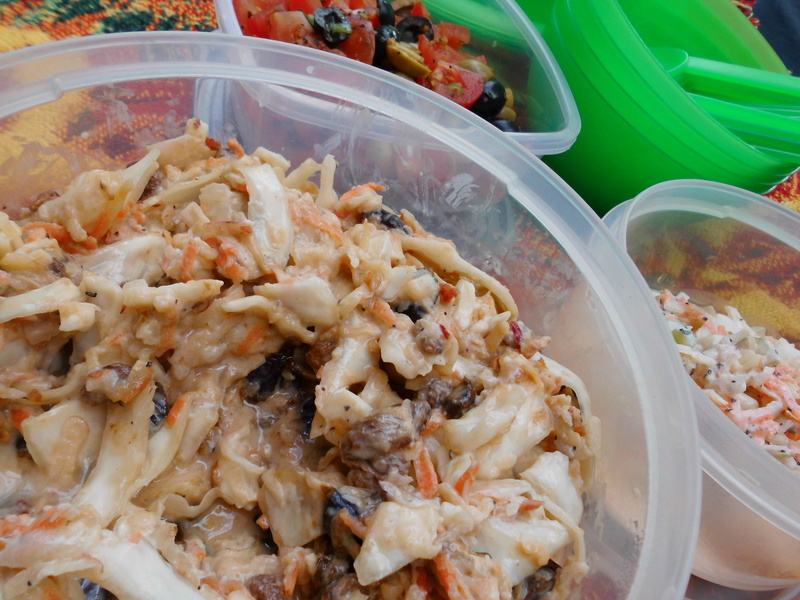 So, offering a low fat and healthy version of coleslaw which benefits with extra taste being infused from the apples, prunes and sultanas. Andrew: And this substituting natural yoghurt for traditional mayonnaise doesn’t negatively impact the flavours of the dish? Dawn: Absolutely not, Andrew. What the natural yoghurt does do is add a similar consistency of texture as mayonnaise while not distracting in flavour from the other ingredients. And is a very low fat and healthy alternative. Next, add the shredded carrot and apples, sultanas and chopped prunes. Mix all these ingredients together until the ingredients are coated with the yoghurt. Season with salt and pepper as per your personal preference. Serve either as a small standalone meal for up to 4 people or as an accompanying dish to other salads, fish and/or meat dishes. For more recipes from the Cooking Duo, follow @Love_Food_UK on Twitter and follow this blog www.forfoodlovers.wordpress.com. You’ll also find us on Mumsnet Bloggers Network and Foodies100…oh, and did we mention Facebook at www.facebook.com/lovefood.forfoodlovers? See you there for more fab food chat!